When we talk about Enagic Kangen Water products we are talking basically about Enagic Kangen water machines that produce the ionized alkaline water. 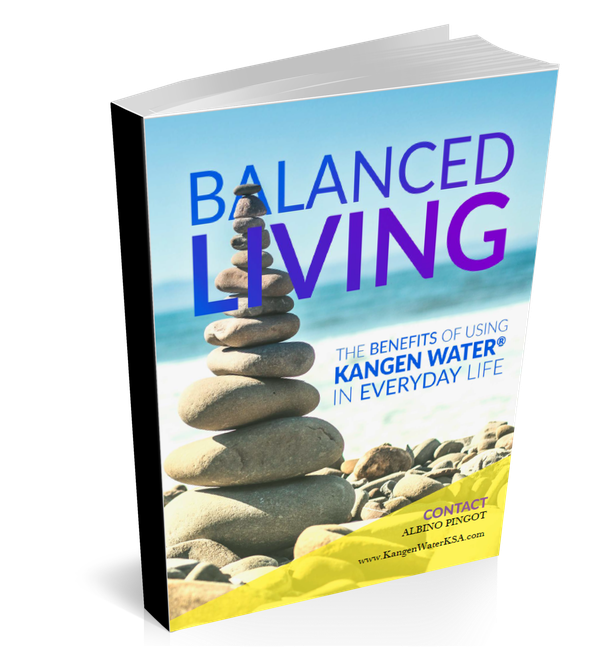 As to date as of this writing, Enagic Kangen water has 8 different types of models for anyone to choose and suite their various needs for Health and Wellness. This is the latest and top of the line product of Enagic Kangen water machines. The K8 (Kangen 8) is Enagic’s most powerful antioxidant machine – featuring 8 platinum-dipped titanium plates for improved water ionization and increased antioxidant production potential. This latest model of Enagic Kangen water machine is the most powerful anti-oxidant producing machine enabling 5 versatile types of a continuous stream to meet your various commercial needs Like the Kangen water; Strong kangen water; Neutral water; Beauty water and Strong acidic water. The K8 consists of 8 platinum coated Titanium plates to improve the water ionization process, increase antioxidant production potential and for stable production of pH and ORP at a higher flow rate. The K8 machine is a great use for small business and families. The Full-screen LCD Touch panel with a voice prompt easily enables you to select any 5 types of water on a friendly user, colored and easy to understand touch buttons. A clear voice-over will confirm the type of water you have selected generating instantly ionized water coming out at the flexible pipe tubes. Multi-voltage Power supply, that you can use to anywhere around the globe. Automatic cleaning Feature that water drains in 10 seconds after 10 minutes of use. Smart Filter Technology that advises you when its time change the filters. The SD501 Platinum version is the first class model machine at its finest with its highest quality built-in electrolysis chamber that you can not find on the market. The all-new Platinum features a revamped modern design that has the same powerful performance in an all-new package and works well beautifully in today s modern kitchen set-up. Smart New Look, Same Reliability! Generates: Strong Kangen Water, Kangen Water®, Neutral Water, Beauty Water, and Strong Acidic Water. The SD501 is extremely user-friendly, thanks to a large LCD panel and clear voice prompts. With just a touch of a button, you can have access to any of the 5 waters you choose. Your machine will confirm the water you have selected with a pleasant voice, and in moments the machine will generate healthy, ionized water through a flexible pipe. The secret to its powerful performance is the (7) seven platinum-coated titanium plates that produce easily 1.2 to 2 gallons of delicious and wholesome Kangen water in a minute from this fully-automatic process. The SD501 Platinum is a multi-language expert machine that “speaks” in 5 languages: English, German, French, Italian and Spanish! With just a touch of a button, you can have access to any of the 5 waters you choose. The SD501 is Enagic’s Flagship model the original version as the finest machine in its class, with the highest quality built-in electrolysis chamber on the market. This Kangen Water model filtration machine generates a continuous stream of 5 types of water. Generates: Strong Kangen Water, Kangen Water®, Neutral Water, Beauty Water, and Strong Acidic Water and the preferred model suitable for today’s home use. The SD501 is Enagic’s “Flagship” model because it provides additional stable oxygen, better micro-clustering, and higher negative ORP levels. Like all 501 models, the SD501 uses innovative electrolysis technology with 7 platinum-coated 99.97% pure titanium electrode plates. You can easily operate the SD501 with its large LCD panel and clear voice prompts. When you need enough delicious, healthy alkaline water to hydrate your whole family, the SD501 is the best product for you. Although it is incredibly powerful, the SD501 is also very compact and perfectly suitable for your kitchen cabinet. This 501 Super highly productive machine has 7 and 5 electrode plates, a twin hose system, industry leading cleaning system, a built-in tank for the electrolysis enhancer, and a water pressure regulating function making this machine a must for the large family. This powerful Enagic machine is designed for a large family unit, and the top of the line model for heavy home use or for small businesses. Best Suited for Nursing homes, agricultural colleges, and spas can all benefit greatly by having the high-performance Super501! Generates: Strong Kangen Water, Kangen Water®, Neutral Water, Beauty Water, and Strong Acidic Water. With 12 platinum-coated 99.97% pure titanium electrode plates, this highly productive machine generates all 5 different types of Enagic water for countless uses around your home or business. If you’re looking for a super-sized SD501, the Super501 is exactly what you need. With just a touch of a button, you can have access to any of the 5 waters you choose. Your machine will confirm the water you have selected, and in moments the machine will generate healthy, ionized water. Your SUPER501 will even notify you when it’s time to change the water filter via a message on the LCD Panel and a buzzer sound. The Super501 features the same quality built-in electrolysis enhancer tank as the SD501, and can generate up to 2 gallons of water a minute for approximately 30 minutes at a time, so you will never run out of the water you need to run your business. This hefty machine also boasts 2 flexible pipes – one specifically designed for Kangen Water® and the one for Beauty Water. The JRII is considered one of Enagic’s “starter” models. it has fewer plates (three solid electrode plates,) enabling less power consumption and an energy cost saving machine. Ideal for singles and couples . The JRII has three solid electrode plates, which reduces the energy consumption. Due to the lower power consumption and fewer plates, this machine is considered one of Enagic’s “starter” models. Generates: Strong Kangen Water, Kangen Water®, Neutral Water, Beauty Water, and Strong Acidic Water. The JRII has three solid electrode plates which reduces the energy consumption. Due to the solid platinum-coated titanium plates, this unit can still produce the strong acid and strong Kangen waters. Due to the lower power consumption and fewer plates, this machine is only recommended for singles or couples. The Leveluk-R is one of Enagic’s “starter” models because it is affordable for families on almost any budget, produces 3 different waters instead of 5 from all other machines. This machine produces 3 levels of alkaline drinking waters and Beauty Water, with 3 platinum-coated 99.97% pure titanium electrode plates. Stay hydrated and enjoy healthy personal hygiene at a great bargain! Deliver fresh, crisp, healthy Kangen Water® at the push of a button with our all-new-designed Leveluk R model. Features a bright LCD screen that displays the water selection of your choice. Reduced energy consumption. Due to the lower power consumption and fewer plates, this machine is considered one of Enagic’s “starter” models. This Enagic machine is both practical and highly accommodating. You will still enjoy a fully featured, compact LCD control panel that is wall-mounted. Enjoy the quality and power of the SD501 right at your kitchen sink – without sacrificing valuable counter space! Generates: Strong Kangen Water, Kangen Water®, Neutral Water, Beauty Water, and Strong Acidic Water. Like all 501 models, the SD501 uses innovative electrolysis technology with 7 platinum-coated 99.97% pure titanium electrode plates. You will still enjoy a fully featured, compact LCD control panel that is wall-mounted. Treat yourself to a soothing hot spring experience with the ANESPA DX! With an abundant flow of mineralized water and a relaxing massage shower head, your bathroom can instantly turn into a calming hot spring oasis. Generates: Mineral ion water for your bath or shower. The cartridge purification system effectively removes chlorine and bacteria, leaving you with a fresh, invigorating feeling. Protect your delicate skin from the harmful effects of tap water. Active charcoal filter Futama-ceramic inner filter. Electrode plates: N/A |Plate size: (mm)N/ |Generates: Mineral ion water for your bath or shower |pH Range: Same as tap waterWattage: (W)N/ATotal weight: (kg)2.5 |Dimensions W x Diameter: (mm)130 x 346 |Production rate: (l/min)2.6 |Ease of Use:Very simple to install and operateWarranty: (years)3 |New features for DX model:Larger ceramic cartridge containing a greater amount of ceramic balls. New, redesigned base for a more efficient filter replacement process. Comment Below if you find this information about Enagic Kangen Water Products Helpful.